This tweet by @AusLeisure was retweeted by @ATECtoday, the Australian Tourism Export Council – “the peak industry body representing the $26 billion inbound tourism industry Australia” (as quoted from their Twitter bio). @AusLeisure’s news release quoted a critique by Tasmania’s Tourism Industry Council on the lack of investment made by Tourism Tasmania in tourism marketing. And I couldn’t agree more. One of the problems with tourism bureaus and their marketing/communications is that they’re too slow to integrate their social media presence – the fact that @tourismTAS hasn’t responded says much about their commitment (Tourism Tasmania seems to use their Twitter account primarily as a ‘news push’). They are, unfortunately, doing what a lot of commercial entities are doing – creating accounts without a strategy around why. What’s disappointing is that it isn’t the bureaus who lose out, it’s the local tourism industry that loses. 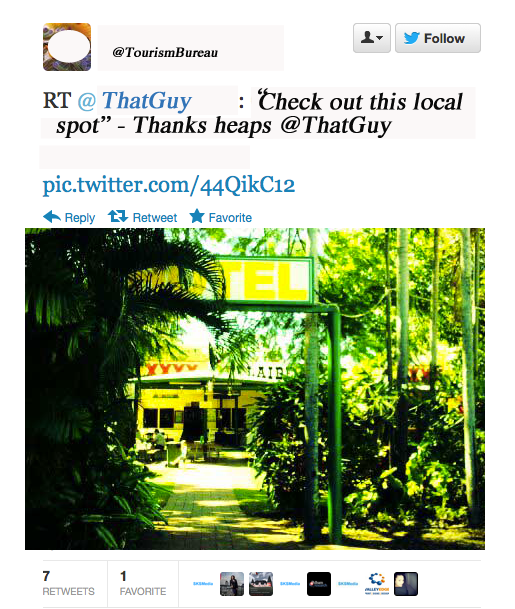 Tourism bureaus need to look at their social media channels as opportunities, not added communications burdens. By failing to invest in an integrated approach, they’re missing valuable opportunities to get in front of their clientele. Yes, it costs money for the resourcing (you need good community managers to run it all), but there’s one thing every bean counter always forgets – having a social media account is free. FREE. This means millions of free opportunities to engage with potential travellers. You may have a Facebook page with 1,000 likes, but what about the markets that lie on other networks? For example, just about every tourism board in Australia has a presence on LinkedIn (from my research there was only one that didn’t – very naughty). Of those present, only 50% had an updated and fully-complete organisational profile. Why is this important? According to the Australian Business Traveller website, over 2.5 million Australian business travellers fly around the country per year. LinkedIn is a professional social network aimed at business people. This is a brilliant opportunity to be marketing your bureau to a specified target market! Twitter is an even better example. The excuse I’ve heard a thousand times is “there aren’t enough of our audience on that network to make it worth the investment”. Is that so? Tell that to Queensland Tourism during its ‘Best Job in the World’ campaign (#bestjobintheworld was a leading trend for days leading up to the competition winner announcement). While it’s true that digital marketing evangelists love to roll that example out, the results show the possibilities. This shouldn’t be a one-off. The biggest problem I see with tourism bureau Twitter accounts is the lack of consumer engagement – while there are a couple doing their best (@Queensland do pretty well), these accounts are solely used as ‘news push’ points (tourism news being linked on Twitter). Think about this – how many of your followers are consumers? A fair few. How many of them are interested in your annual report? None (unless they’re in the media). I tip my hat to the tourism bureau community managers that are doing their best to utilise what resources they have – trying to sell more ‘consumer engagement’ is a difficult job. But you’re not off the hook. You need to continue to fight for more and give reasons why the head honchos will give you the budget: Create objectives and strategies to meet them for each social media presence; define what that account’s role is (LinkedIn for business travel, international consumers on Twitter, etc); and scream for a comprehensive monitoring tool – the results will allow you to present ROI reports on the bureau’s social media activities. Remember: What you are doing isn’t just good for the bureau – it’s for the people you’re representing in your local tourism industry.